"...for many NZers that sight would have them choking on their dinners." Well it certainly had you choking on your cheeseburger. Um, no it didn't, I had organic local made sausages with organic local made humus with local grown lettuce for dinner last night. "My personal highlight was being told by one of the supporters that I was a ‘left wing douche bag who didn’t understand history’ – their aggressive assertion that they were right seemed so 1936." At least you have recognition from the chinese community and you know someone watches your shows. I have to agree with everything you wrote their, nuremberg rally sprang to mind. The chinese govt are very new at trying to understand public relations. It is an art they have not bothered with before due to not needing too. These embassy organised rallys will win them no friends in the west. This was such a mistake by the organisers - what a great way to completely polarise the whole country against you with what appeared to be an undirected, overzealous burst of extreme-nationalism. I think NZers should be understanding though. Most of the protesters were presumably recent immigrants (foreign students) from looking at the footage, so they have been taught propaganda as truth since birth. This would include a revisionist history of Tibet as always being part of China. Add to this the groupthink that occurs within small communities; as well as the increased nationalism that most diaspora communities experience, and this kind of protest must have seemed like a good idea to most of the protesters. Chinese mainlanders are very protective of their territory. Even mentioning the word "Taiwan" in a classroom as a purely geographical reference will prompt a delegation. What is even more surreal is being Zimbabwean and having Chinese youngsters talk about the An Yue Jiang and the weapons sent to Zimbabwe and rejected by every African country with a coastline. "Why is everyone hostile to us? We are just doing normal business. We are the business not the person who uses the weapon. The USA sells more weapons than we do"
And a bullet that says "Made in China" feels different from a bullet that says "Made in the USA"? Great post brother. Wish I was at Aotea Square with you to stand up to these brainwashed National Socialists. I hope my kids are never afraid of an asian when they are walking down the street, these chinese might be patriotic but they also get a bit intimidating. "left wing douche bag who didn’t understand history"
Yeah! I understand history perfectly well! Who uses douche bag as an insult these days anyway? Old 1990s Teen movie watchers? The human rights movement/group of the world seems to have two standards, one for the western world and one for the developing world. When China arrest someone without trial it is violation of human rights, when the American arrest someone without trial that person is a terrorist and the American has every right to do so. If there is a competition for human rights violation, possibly the Americans will be a winner for its records in Guantanamo bay and Al Gharaib Prison in Iraq. Why not all these hypocrites human rightist protest at the white house instead of just picking on China. I think you'd find M. Boom would be blogging just as stridently if Aotea Square was full of hooded goons on horseback waving Old Glory. I think what we're seeing here is a (long overdue) correction to the excesses of cultural relativism - the notion that the West is bad and everyone/thing else, good. While *we* have a hell of lot to answer for, ask yourself this: how do you think Chinese authorities would have reacted had 4,000 Aotearovians taken over Tiananmen Square? PROMISE TO DROP THE FTA AND I'LL PARTY VOTE NZ FIRST FOR THE 1ST TIME! I wonder what will be the reaction of the pakeha's in NZ, if the Maori or the Tame Iti clique would to fight for the seccession of the entire Hawkes bay. I think instead of just protesting in Aotea square, they will possibly be up in arms with guns and bombs trying to invade Hawkes bay. And what would Kiwi feel if the rest of the world would to support Tame Iti or the Tuhoe tribe on that cause? 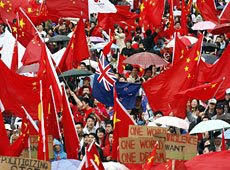 Asking China to give up Tibet is like asking NZ to give us any of its territory to any Maori Tribe. So how can you blame the Chinese students from protesting and showing to the western world their concern. Isn't this will also be the action of the thousands of patriotic kiwis around the world if this is to happen to NZ. Stop using the word 'clique' to describe the bad guys. Only in Pyongyang do people use loaded, antiquated words like this. Lame. And while you're at it, invest $50,000 in a mid-level journalist (not volunteering) to give your propaganda a brush up. Never mind the truth about Tibet or Darfur or Burma etc... your message is so poorly presented. Step back and read your pronouncements - they're unintentionally hilarious. But they're alienating those you're trying to persuade. PS. While you're at it, get those flame attendants some decent tracksuits. Poor buggers. Yeah right! we are not supposed to call them clique, they are terrorist right, isn't that what they were arrested for. A few maoris having fun with their guns hunting in the forest are considered terrorist. Tibetans running amok burning down houses and killing people is acceptable coz they are fighting for their rights! Hilarious - Lui Bei (we know its you cos you're cut'n'pasting your previous posts). Maybe you didn't realise, but many 'patriotic kiwis' support Maori sovereignty. Having re-educated ourselves from the glorious English empire history books, some of us understand that most Maori land was stolen. And we don't instantly believe a crock of a court case the police bring (most of which has already failed). PM - sorry bout the tracksuits; they are patriotic nationalist garments made in dear motherland China sweatshops. The threads started unravelling as we collected them from the Warehouse... Next time we'll get them from Zimbabwean sweatshops in exhange for another shipload of guns to Mugabe. Thanks for the blog, great perspective. I was there with my parents yesterday...they told me it was to show their support for the Olympics. When we got there, I was like...o.O =.=" *communists*. 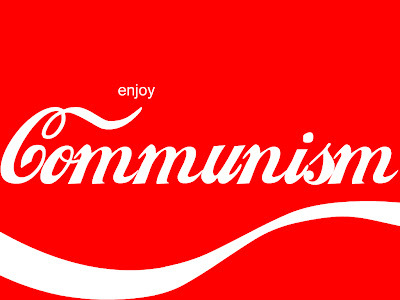 Seriously, the first word that came to mind was, 'communist'. I was born in New Zealand, so I don't know that much about Chinese history, and wasn't about to support the bunch of communists. We weren't there long enough to see the violence. I don't know who's right about Tibet, but those Tibet supporters were just expressing their opinion-freedom of speech! They didn't deserve to get beaten up. I wish that politics and sport would be kept separate from each other. Most of the world is looking forward to the olympics, and I hope all parties resolve their issues because boycotting the olympics would cause great disappointment. The Tibetans have been denied their spiritual leader and other cultural and human rights, and wish to have self governance of their land. Whether or not they would try and kick out any Chinese that now live there I don't know. The Tuhoe tribe can freely practice their culture, their claim is predominantly one of land. I personally believe they would try and forcefully remove anyone residing in their region were it to be granted to them, and I really don't see what beneficent they or anyone else would gain from all that. As a white New Zealander I personally object to the use of the term 'pakeha', as I would object being given a racial term in anyone else's native tongue, but especially in this case because it is most predominantly used by Maori who happen to have an agenda against 'whitey'. I embrace the term Pakeha and very much believe it is the most appropriate term for me ti use, it makes me unique, not just another 'European' - I find a lot of other white folk don't like it though and freak out as they have believed it means things like'white pig' or other such nonesense, as these myths have been exploded those who didn 't like the term have had to sink to other reasons to justify their dislike. Is not identifying with the Maori culture not a good reason to dislike it being forced on me? In fact I don't identify much with the Europeans ether and object being called European as well, and yet there it is on every census etc supposedly for me to tick. I always tick 'other - New Zealander'. I believe the terms 'Pakeha' and 'European' refers purely to ethnicity. Ticking 'New Zealander-Other' reminds me of a friend who wanted 'Chinese New Zealander' to be an option on the census...they ticked 'New Zealand-Other', too. I guess 'European' is a more specific name than 'caucasian' or 'white'. You don't see Pakeha as a positive term? It's unique, it's organic, it's identifying - 'New Zealander' could be a new arrival from that island Zealand.